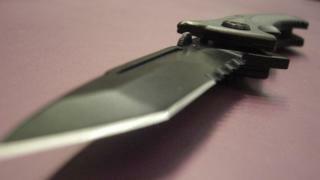 The number of offences involving knives or sharp objects has more than tripled over five years in some parts of Wales. Gwent Police saw the biggest jump in the 12 months to September 2018 compared to 2013 going from 42 to 141 incidents, a 236% hike. North Wales Police was up 211% with 277 cases in 2018, while Dyfed-Powys Police cases more than doubled from 75 to 156. The lowest rise came in the South Wales Police area, but it had the highest figures - 735 in 2018. All forces have been asked to respond. Are school exclusions causing knife crime? In February, South Wales Police said more than 100 arrests relating to knife crime were made in Cardiff over a six months as part of Operation Spectre. There were also 350 "stop searches". At the time, Chief Constable Matt Jukes said: "You are at greater risk of being a victim of knife crime if you carry a knife yourself." Home Office figures showed the number of fatal stabbings in England and Wales in 2017-18 is the highest since records began. In Wales, however, they were low with one death in each of the force areas except for South Wales where there were five.